Tarab consists of being such an artist, being so deep in your own "saltinah", that you become able to affect the audience in an ecstatic, almost hypnotic way. Tarab is not a compliment you give yourself. It is called a gift from God by those who have studied and performed for a lifetime. An artist can sometimes go into the tarab zone and take an audience with them. It is a height that one aims for. In Egypt, people accept that the only artist who could attain tarab every time she performed was Umm Kulthum. It is important to understand what this phenomenon is, and to understand its place in Middle Eastern culture. It is important to train until your body can perform anything that your soul commands. It is important to work on improvisation so that when you go into "sultinah" your body will follow your soul's interpretation. At this time you are not supposed to be thinking and remembering movement by your brain. A choreography is made/developed/crafted as a response to the music or feeling of one moment, maybe in a studio, maybe with no other people there, maybe to a CD that played the same way every time. However, when you perform, you are in a different space. If your goal is to perform a wonderful choreography then all is fine. But if your goal is tarab, to take a lesson from the homelands of tarab, you are supposed to relate to the immediate energy of the moment, releasing the brain and responding to the immediate music which is being played by live musicians who are also playing from feeling. Then, if God smiles on you, the music will be lifted, you will be lifted, the audience will be lifted; you won't remember what you did or what the musician played, you won't know if it was 20 seconds or 20 minutes. But the audience will remember that moment for years and cry when they recall it. It is not a name of a dance or music style, and not a compliment you give yourself. 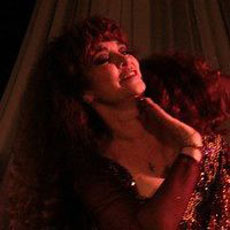 Sahra started her bellydance career at the Arabic nightclub, The Cascades, in Los Angeles, CA. While she had always been interested in the intersection of culture and dance (her Bachelors was in Cultural Anthropology and Archaeology), a need to grow as a dancer sent her to the University of California in Los Angeles (UCLA) where she pursued a Masters degree in Dance Ethnology. Through the course of her study, she had the amazing good fortune to find a great friend and mentor in her program, Farida Fahmy. When the time came to begin research for her thesis on the Zeffat al’Arusah, Farida encouraged her to come to Cairo and pursue that research in person. While in Egypt she received a contract performing dance at the Meridian-Heliopolis 5-star hotel, which she held for nearly 6 years. Her position as a local dancer gave her an amazing springboard to learn about the zeffah, and so much more. Sahra now teaches and dances around the world, sharing her theories on dance in Egypt, the regions, the “tables”, and the way everything fits together. 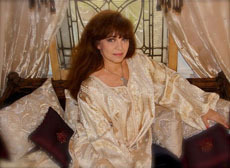 She is constantly conducting more research with two trips to Egypt each year, every time hunting for that next “puzzle piece” that will reveal ever more about the dance, and the culture, that she fell in love with over 30 years ago.